Geothermal Energy - clean energy solution for future. Read more about trends, new technologies or investment opportunities. We contribute with our knowledge to the introduction of drilling system of the future, which would enable to drill deep wells at reasonable price. EXPO Milan 2015 provides an opportunity to seek solutions to the contradictions of our world. There are approximately 870 million people suffering from daily starvation. Food security is strongly dependent on effective energy supply that is continuously failing in developing countries. High energy volumes are just beneath our feet; even in the areas of drought disasters. Geothermal energy considered to be “energy for life” still remains untouchable. This quest needs a real ground-breaker. 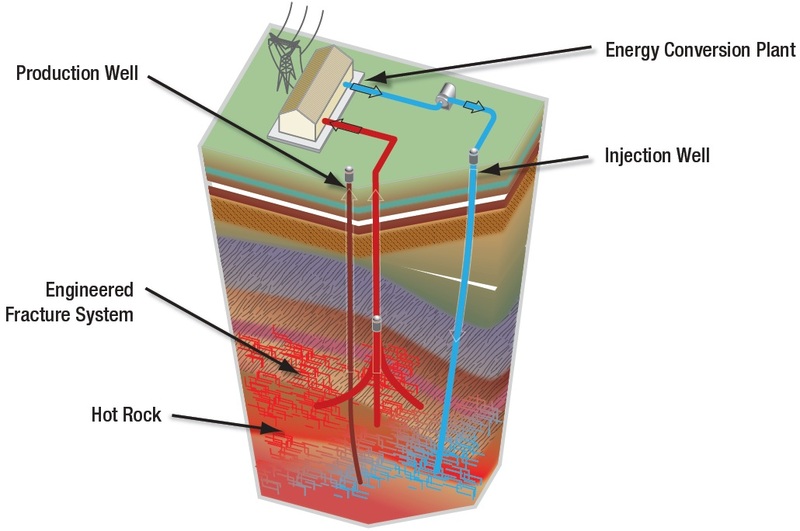 Plasma based drilling technology by Slovak pioneers from GA Drilling enables an effective access to geothermal energy. This groundbreaking innovation takes part in EXPO 2015; recognized as world’s prestigious visionary showcase. It has the ability to drill economically regardless the depth and can be applicable at depth up to 10 km, which is the area suitable for extraction of hot geothermal reservoirs anywhere. This ground-breaking technology is built to let the geothermal heat cascade economy thrive in volumes currently not possible. A geothermal heat cascade economy has the potential to create new jobs and local autonomous economies. The cascade consists of hydrogen production, electricity production, direct building heating and cooling, biotechnology reactors, aquaculture, fisheries, wellness, geothermal heat pumps, etc. In the second decade of the millennium, the geothermal energy is going to play more crucial role in the energy mix of countries around the globe. The theme of EXPO 2015 "Feeding the Planet, Energy for Life" sums up the most important issues that human beings must address in an effective manner to safeguard life on the planet. An optimal balance between natural resources and the production of food and energy is a fundamental condition for ensuring the survival of the eco-system. The keywords here are: innovation, energy conservation, environmental protection and natural resources. It is one of the reasons, why innovative drilling technologies serving as the key to geothermal energy reservoirs need more promotion and global awareness. EXPO 2015 is hosting Milan, Italy from 1st May to 31st October 2015. It is expected to welcome over 20 million visitors promoting more than 140 participating countries. Follow Geothermania on LinkedIn, Twitter and Facebook! Strong and weak aspects one can identify when studying various issues. Let's summarize impacts of geothermal energy. In this shot we will write about impact on environment, the next one will be focused on human health impact. The linguistic origin says that „Geothermal“ represents the heat coming from Earth's depths („Geo“ like Earth, „thermal“ like heat). It means that this source of energy is natural and this heat is primary one. In comparison for example with fossil fuels, there are no additional steps or „mid-steps“ required in order to make and obtain heat. In previous article we wrote that according various estimations, Earth accumulates heat that would be enough to satisfy global energy demand for more than 10 billion years (see this link). In addition, this heat is accumulated either by adsorbing sunshine through surface or by happening specific chemical and physical reactions in Earth's solid iron core. Dangerous products of these reactions (UV radiation, dangerous gases, nuclear elements etc.) remains either in space, outside the ozone layer of Earth's atmosphere, or enough deep in proximity of Earth's core, which means deeper than magma. Therefore creating of this heat doesn't represent relevant danger, no question about it. Drilling issue is comparable with mining issue in matter of obtaining power sources for coal or nuclear power plants. On the other hand, geothermal wells do not require such a long diameter than mining s ahaft or the colliery. It is true that geothermal wells could be deeper than mining shafts, but altogether they require less capacity of soil to be removed. Cooling the Earth is being mentioned as the second objection. Yes, if we exploit more heat than is capable to be renewed, by time the geothermal well produces ever colder water stream and becomes comercially uneffective. This can be resolved by better customizing EGS approach (more about EGS on this link). Water issue becomes step by step of an ever higher political priority. Climate change means also the change of global water regime. On the other hand, operating geothermal wells is managed like closed water loop, so there can be no question about wasting the water sources. In conclusion, environmental impact of geothermal energy depends on how it is being exploited and which approach is taken. But geothermal plants in general does not burn fossil fuels or coal in order to produce electricity. In comparison with „traditional“ power plant, it produces just 1 percent of CO2 emission in contrast with incineration of fossils. In addition, U.S. Environmental Protection Agency (EPA) adds regarding geothermal heating systems (secondary utilization of geothermal power) that geothermal heat pumps are the most energy-efficient, environmentally clean, and cost-effective systems for temperature control. Altogether, geothermal energy represents clean modern solution for growing energy demand as well as for steps against climate change. 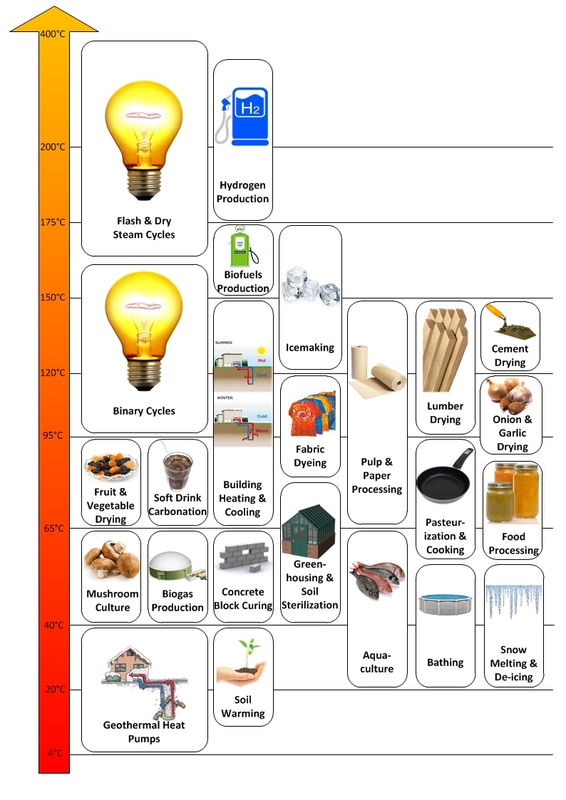 Thermodynamic cycle is about turning heat into work (we mean physical term of „work“) under concrete pressure, temperature and other physical factors. In ideal case, transforming heat into work as well as work into heat, can be described like zero sum game. So, if there would not had been any losses (it means ideal case), the whole amount of energy in form of geothermal heat would have been transformed into the same amount of work and later on electricity. In reality, effectiveness varies regarding the concrete type of used thermodynamic cycle. On field of geothermal energy, there are used several types of thermodynamic cycles - e.g. Kalina cycle, Organic Rankine Cycle (ORC) and other - or their combinations. The use of concrete type of cycle depends on quality of reservoir, the pressure, water temperature and many other factors. As we mentioned above, every transformation of one type of energy into another is accompanied with losses. In this regard, optimization of geothermal energy production process is necessary in order to minimize those losses. Optimization means the most appropriate combination of thermodynamic cycles and the most appropriate setting of other physical parameters. If you are interested in the most used thermodynamic cycles in geothermal energy, next articles on this blog will be dedicated to this topic. We will also bring concrete case studies – description of some geothermal wells and facilities in Europe. In recent years, a large effort has been done to utilize a heat from the earth. Geothermal companies all over the world try to make another step to this goal. They get started an intensive research of supercritical fluids, mainly supercritical water (SCW). 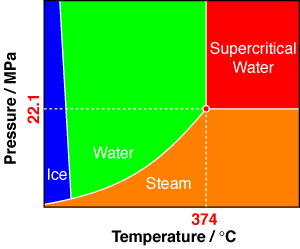 SCW is a specific state of water which is very hot and under so much pressure that it exists somewhere between water and steam. The boundary of this state are conditions with temperature higher than 374°C (705°F) and pressures over 22.1 MPa. SCW has several interesting features; its main disadvantage is the fact that it is very corrosive. On the other hand, advantages can be utilized in several industry segments. Nowadays the most famous attempt to utilize the supercritical water as an energy source is the Iceland Deep Drilling Project (IDDP). The approach in this case is simple; developers are trying to drill a well two miles deep into the active Volcano crater, Krafla and that way to reach 400-600°C hot supercritical hydrous fluid at a rifted plate margin. When this fluid hits the surface, it will have much more energy than fluid in conventional thermal cycles. The result is radical increase of power output from one geothermal well. It is necessary to mention that geothermal conditions in Iceland are extraordinary and there are just a few other locations in the world with similar opportunities. More detailed information you can find on IDDP. Therefore, for the utilization of this phenomenon is required an improvement of current drilling methods for accessing the geothermal reservoirs with supercritical conditions. On the other hand, SCW could be an effective support during the process of drilling. Its aggressive and corrosive nature can are suitable for increase of the disintegration process. Naturally, the drilling tool with high corrosion resistance is required. This process is mainly suitable for drilling techniques based on thermal approach, such as plasma, which offer high heat flow required for supercritical conditions. SCW could be utilized not only in geothermal segment, but according to recent research, using it in the process of material or waste disintegration is very promising. We hope that research of the SCW in all mentioned segments will continue and bring sufficient results. What steps can individuals, businesses or world leaders take to address the most pressing and often interrelated water and energy challenges? To answer this question it is necessary to look at the sources which we walk on. From the volume perspective, only 1 % of the Earth is colder than 1000°C and 0.1 % is colder than 100°C. This amount of energy is available continuously 24/7 without any carbon dioxide or other pollution and practically not exhaustible. Heat under the Earth’s surface is still permanently produced in the Earth’s volume by decay of uranium, thorium, etc. For effective geothermal electricity production, there is a need to drill between 8-10 km in hard rock, where the temperatures almost anywhere in the world exceed 300°C, optimal for steam turbines and high enthalpy heat production. Research and development in emerging drilling technologies is aimed on effective deep drilling in hard rocks with the price linear with the depth, which is significant advancement in drilling technology. This enables to exploit geothermal energy practically anywhere in the world independent of the local geological situation. The most promising solutions are drilling systems based on thermal treatment on rocks. These systems provide cost effective and high speed drilling optimized for the hard rock environment. The technologies are oriented towards creation of power generation units ranging between 20 MW to 30 MW per unit, where drilling costs are expected to be less than $1M per drilled km. 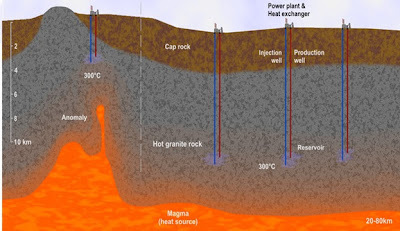 The main aim of the technology is to bring the position of the geothermal energy in the world energy mix to its real potential as base load energy and real alternative to coal, oil & gas and nuclear, by RADICAL change through cost effective deep drilling. Substantial contribution of geothermal energy to climate change mitigations. Energy distributed production to geographic localities where energy is needed and not where resources are available. It provides minimum transport losses in contrast to present day grids, high security against the collapse of energy systems and security against terrorist attacks. Affordability for developing nations, because the source of the energy the “fuel” is available anywhere. Small footprint of geothermal energy production sites not harming the country environment in contrast to wind farms and photovoltaic large area fields. Safety of the processes compared to nuclear energy. Accessing new reservoirs of oil and gas - In recent decades new deep underground reservoirs that require significant advance in drilling technologies were discovered. One of the main innovations of emerging drilling systems based on thermal approach is the ability to produce continuous casing while drilling. Casing is created synchronously with the drilling process immediately in the drilling bit zone ensuring sealing and mechanical stability of the well all the time also in difficult conditions. This is a key factor in onshore, but even more considerable in offshore drilling with game-changing cost reduction. Moreover it reduces need for Shale Gas extraction and other methods with negative environmental impact. Deep hidden water reservoirs and possible desalination on continents - Water wells in regions with limited access to drinking water but with rich sources of deep water reservoirs. Another utilization are geothermal wells for power generation aimed at desalination. Main targets areas are Africa, West and central Asia and Australia. Centers of prosperity - Geothermal heat cascade exploitation economy around each geothermal power generation complex, creation of new jobs and local autonomous economies. The cascade consists of hydrogen production, electricity production, lumber drying, direct building heating and cooling, biotechnology reactors, greenhouses, aquaculture, fisheries, wellness, geothermal heat pumps, etc. For development of such prosperity centers, the franchising concept could be applied. Interested in knowing more about Geothermal District heating, what it can do for you and what the future holds? Join European Conferences on Geothermal District Heating (22-23rd September in Brussels) for information on the prospective and potential for geothermal district heating in Europe, as well as information on financing, business models and regulation. The second session will cover the technological developments and will be held in collaboration with a geothermal panel meeting, covering the Horizon 2020 in 2015 work programme. These sessions will be preceded by a conference on the EU’s Energy security strategy and the 2030 climate and energy package. National, Regional and local authorities, municipalities in particular. Owners and tenants of large buildings. In case you are interested in this topic, feel free to register here at the official site of GeoDH project. The event is free of charge! If the Asian countries would make full use of the potential they have in renewable energy sources, 94% of the energy needs could be provided. But the countries, including Philippines, must initiate an “energy revolution”, states the newest Greenpeace report. 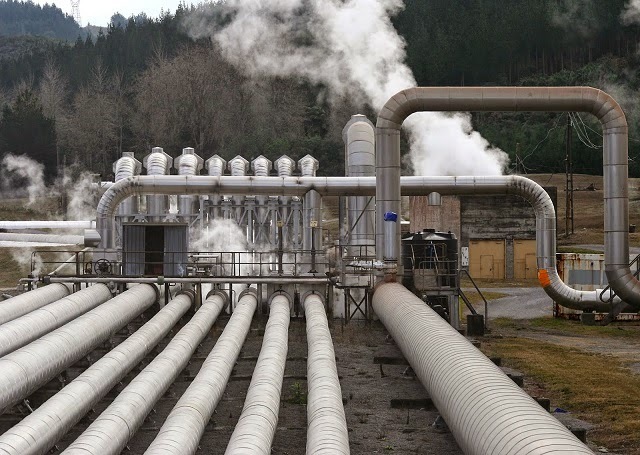 According to the report, geothermal energy has one of the biggest potential in the Pacific region. If we are to reach a drastic reduction of CO2 emissions by 2050, 80% of the world energy supplies should come from renewable energy. The developing Asian states will also have to play a crucial role, claims the Greenpeace report entitled “Energy Revolution: A Sustainable Energy Outlook”. The global investments ought to reach $17.9 trillion until 2030, whereas the share of developing Asian states should amount to approximately $837.5 billion. The Philippines are currently the regions leading country in geothermal energy production. The installed capacity in the country reaches 1.900 MW, which is the second largest in the world. The United States hold the primacy with 3.000 MW of installed capacity. The two countries together with Mexico, Italy and Indonesia account for 75% of the world’s geothermal electricity. Geothermal energy is mainly used for heating. According to the latest report released by Earth Times, the global geothermal energy capacity is currently 18.6 gigawatts, states the portal RenewablesHub. The potential of geothermal energy, an energy source free from greenhouse gas emissions, is more than 70 GW and is available at all time compared to solar or wind energy. However, one of the key conditions for a wider use of geothermal energy are new, cheaper, technologies that could reduce the costs of available and also emerging drilling methods (like that our – PLASMABIT). To achieve exploitation of geothermal energy economically. Geothermania is an independent blog focused on geothermal research and innovation, designed for CleanTech community. It provides a vital discussion forum for professionals in geothermal energy development. GA Drilling 2014. Picture Window theme. Powered by Blogger.